PARK4DTV presents 16 new high resolution wide-screen video works especially and exclusively for free use on large PUBLIC VIDEO SCREENS. Hot News: - PARK4DTV TWEETS - follow park4dtv - PARK4DTVHDSALTO25 - Zeven nieuwe breedbeeld-uitzendingen van PARK van dinsdag 31 augustus tot en met maandag ... - RAUDIO IIIII iThing App JUNE 2011 - JUNE 2011 : RAUDiOIIIII — BE PREPARED FOR iPad APP! 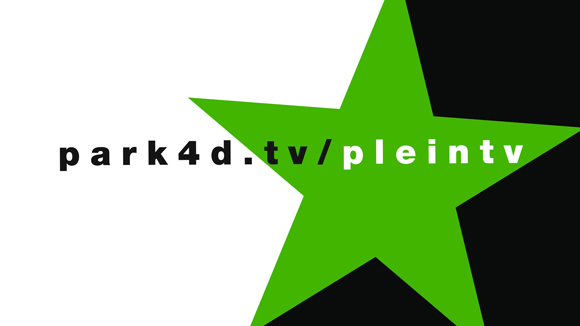 PARK4DTV is a non-profit broadcasting organisation, based in Amsterdam NL. We broadcast art. Pure Image, Pure Sound. 24 hours a day, 7 days a week.